Back in December I posted about the new Adobe product icons and the "controversy" regarding their design. At the time there were a lot of people blogging about how they didn't like the new icons, and I said I would reserve judgment until CS3 came out. 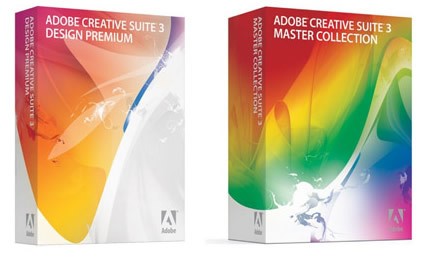 Since the CS3 suite was released today (and a friend actually remembered to ask my opinion), I thought I would post regarding the new icons and packaging design. After working with a few of the icons for the past few months, I'm actually quite fond of them. I thought it would make finding particular applications harder, but it is actually much eaiser. 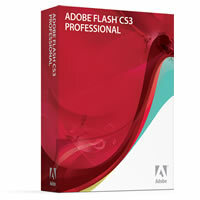 The CS2 icons have no significance -- a feather doesn't really equate to Photoshop, for instance -- but the elemental look of the CS3 icons allows users to quickly scan their dock and find the first letter or main color of the application they are searching for and launch it quickly. Kudos to MetaDesign whom suggested the elemental idea (see the comments on the blog post I referenced above), and to (apparently) the Adobe internal design team for implementing the idea well. In terms of packaging, I think Adobe hit another home run. While the designs have no significance to the products within, other than the colors, I'm quite okay with that. Hopefully the box does at least have a product listing on it, because apparently Microsoft started a trend of offering several packages/versions with Vista, and Adobe picked up on it with their six different versions. Anyways, it is refreshing to see great thought being put into software product packaging, especially in a day when most people download the software instead of buying a box. 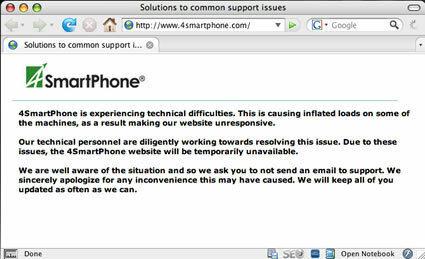 I had previously posted about my love for 4smartphone, the hosted Exchange service I use for my email. Recently I've had several extended outages (6-12 hrs), and this time around I think I may have decided it has become unacceptable. My email hasn't been up and running since around 10pm PST last night -- no Outlook Web Access, no Treo 700w syncing, and no Outlook syncing. Normally a page like this wouldn't bother me, but the page title tells you how often this happens -- even they say this is a "common support issue". Too funny. Not to mention that the attitude they are taking is "Don't tell us, we already know." I even tried searching around Google and came up with a lot of others have the same issues. I think I'll pass this one along to the guys at 37signals for their blog, Signal vs Noise and its frequent "Screens around town" posts. So, does anyone know of any good hosted Exchange services? The major points for me are 1 GB storage and stability. If you are like me you've had a hard time keeping up with the myriad of blog posts about Apollo the past few days. Within minutes of it being released on Adobe Labs there were several blog posts with information, links and even early sample apps. Today, less than one day after its release, that number is well into the hundreds. Mike Downey, Senior Product Manager for Apollo at Adobe, has you covered. He's got a link round-up that accomplishes no small feat -- collecting a "best of" Apollo links, posts and sample apps.